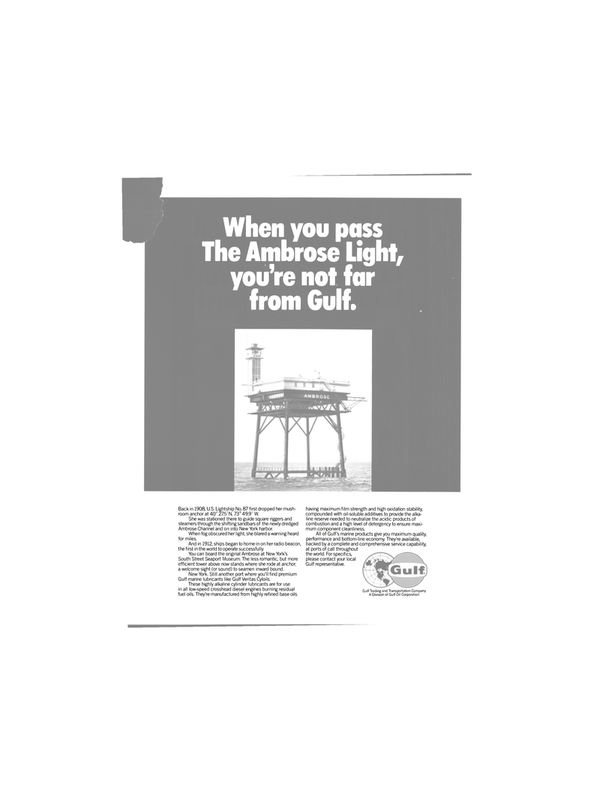 When you pass The Ambrose Light, you're not far from Gulf. Back in 1908, U.S. Lightship No. 87 first dropped her mush- room anchor at 40° 275'N, 73° 49.9' W.
Ambrose Channel and on into New York harbor. When fog obscured her light, she blared a warning heard for miles. And in 1912, ships began to home in on her radio beacon, the first in the world to operate successfully. South Street Seaport Museum. The less romantic, but more efficient tower above now stands where she rode at anchor, a welcome sight (or sound) to seamen inward bound. Gulf marine lubricants like Gulf Veritas Cyloils. These highly alkaline cylinder lubricants are for use in all low-speed crosshead diesel engines burning residual fuel oils. They're manufactured from highly refined base oils having maximum film strength and high oxidation stability, compounded with oil-soluble additives to provide the alka- line reserve needed to neutralize the acidic products of combustion and a high level of detergency to ensure maxi- mum component cleanliness.